The plan will see the separate groups come together to tackle the major projects with combined resources. The port and rail developments are expected to create over 1300 jobs in construction and around 300 long-term positions once they become operational. Some estimates suggest the plan will attract up to $6 billion worth of investment. 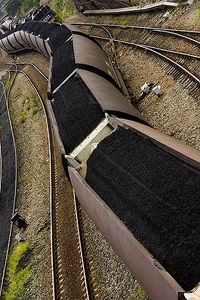 The two companies have agreed on a draft infrastructure deal which would see Aurizon acquire a 51 per cent stake in Hancock Coal Infrastructure (which runs GVK’s rail and port works). Aurizon will reportedly provide upfront consideration initially, and deferred consideration at the financial close of each phase of the project. “This will deliver significant benefits for regional communities by reducing the impact on agricultural land and the natural environment,” a joint statement from GVK and Aurizon said. The current plan will see 300-kilometres of an eventual 500-kilometre rail corridor built during phase one, which will then be connected to existing Aurizon lines. “This will also allow a phased development at the Abbot Point T3 terminal to match volumes and ramp-up, thereby materially reducing the initial cost of infrastructure,” the companies’ statement said. The narrow-gauge southern rail connection will be able to carry 25000-tonne trains. A full greenfield line may also be added, if there is need for extra tonnage. “This work not only brings us a step closer to jointly providing the primary rail and port solution for the Galilee, it brings the whole region a step closer to realising the benefits of one of the largest regional development opportunities this state has seen for decades,” said Aurizon managing director and chief executive Lance Hockridge. The agreements are currently non-binding and subject to board approvals, but both companies have welcomed progress so far, and say they intend to work on more complete plans in the coming months.